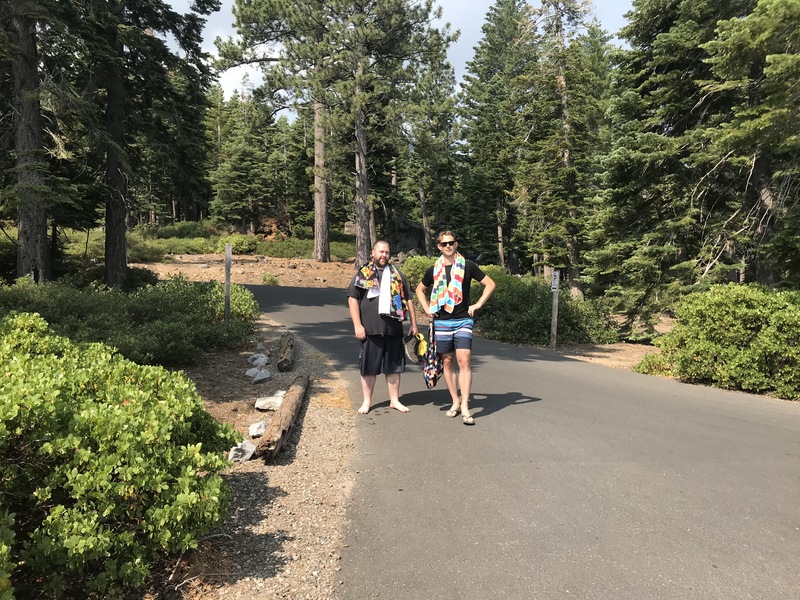 We’ve lived in San Francisco for two years and we’ve never made it to Tahoe which is about 3.5-4.5hrs drive away depending on traffic. We’ve joked that we’ll never make it for skiing though we really do hope to! So we finally tied down a date, booked the last spot available at a lakeside campsite, invited a few friends (though only one could make it) and left at about 7am on Saturday morning! On the way we needed our weekend fix of espresso and it’s always a mission to find the perfect cup. Lindsay has this down to a fine art, and we stopped in Roseville, close to Sacramento for coffee at Fourscore. He outdid himself by finding perfect coffee in a stunningly restored old part of the town. 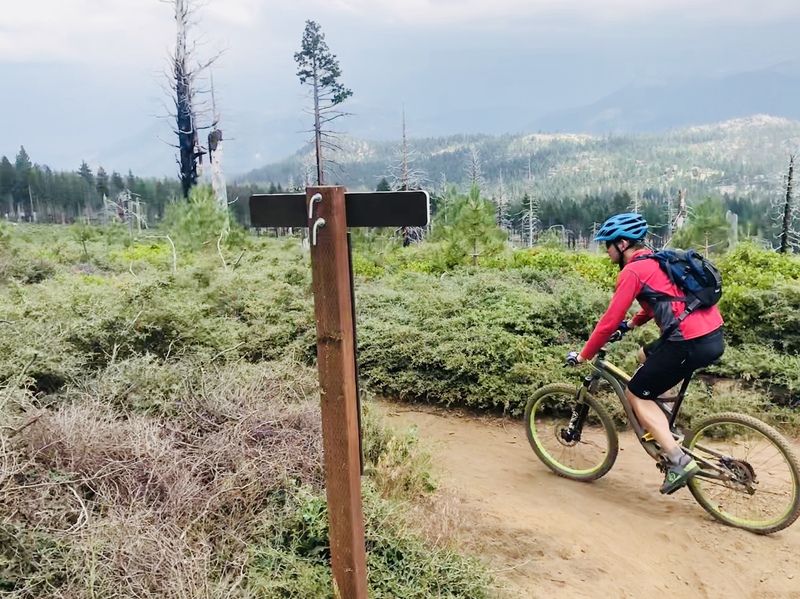 Lindsay had wanted to ride another trail, but with it being the height of summer and schools on vacation, the roads to Tahoe were packed and we made slower than expected progress. 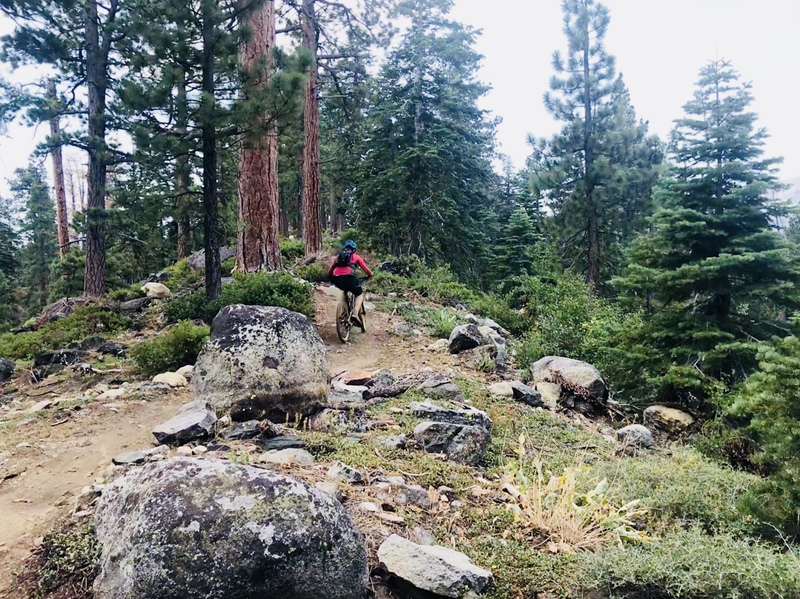 Along the way he changed tack deciding to ride the Anogora Ridge/Tahoe Mountain loop. 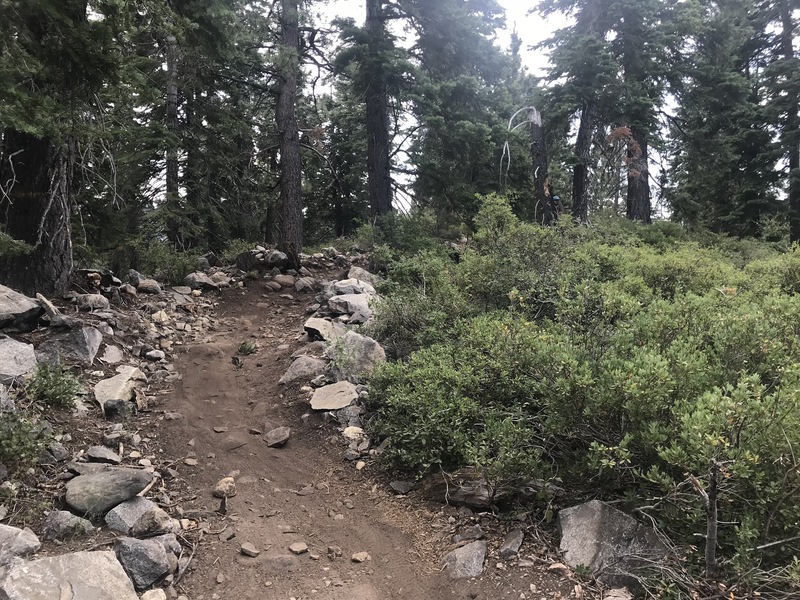 The trail was 12+ Miles,and was close to our campsite looking out over lake Tahoe. We could drive and park right up to the start of the trail. There was a short rugged ride that took us up to a fire road. We could have carried along the road for a while, or get back on the mountain bike trail which is generally always our preference. This part of the ride was pretty with views out to Fallen Leaf lake. 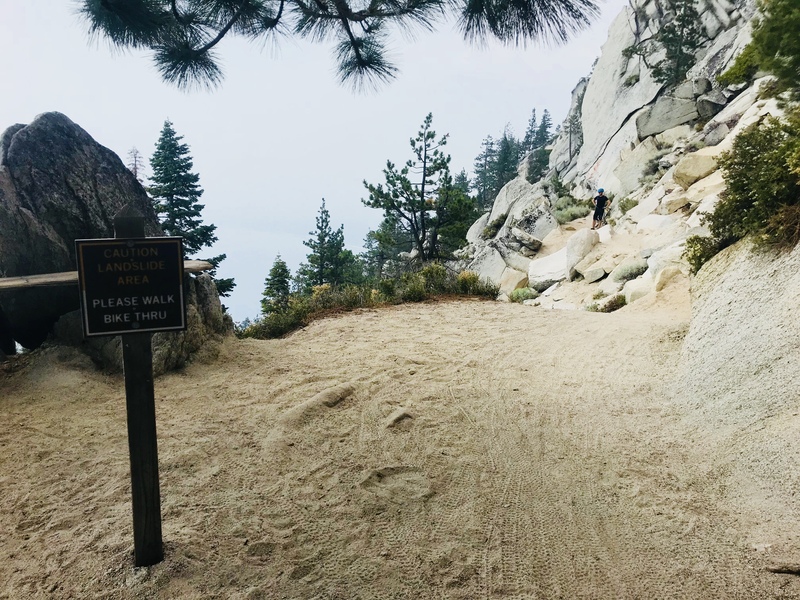 A single track, it was so dry, with the finest brown dust that made its way through my closed toe Giro shoes and socks, leaving my feet filthy. 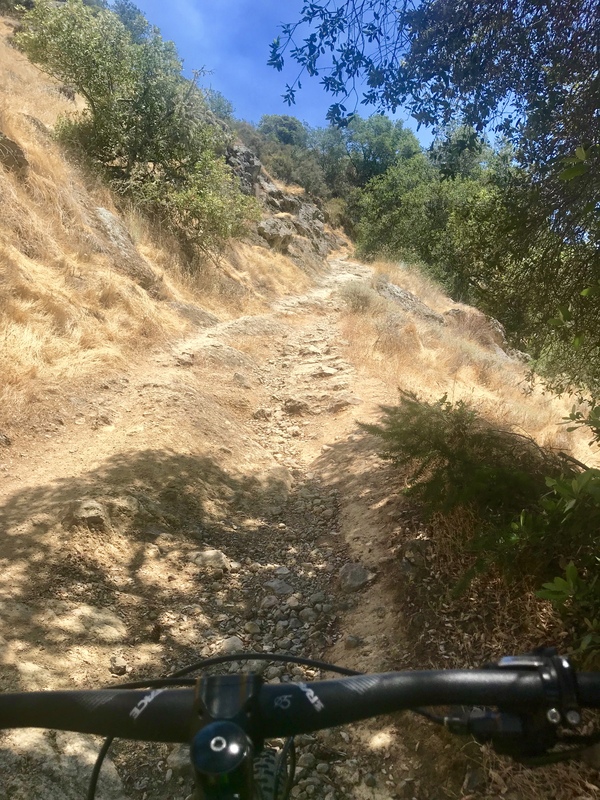 The weather was warm early 30’sC/late 80’sF, there were lots of loose or jutting rocks and a steady climb up to 7200 feet, making for a slow, sweaty, heart palpitating ride. 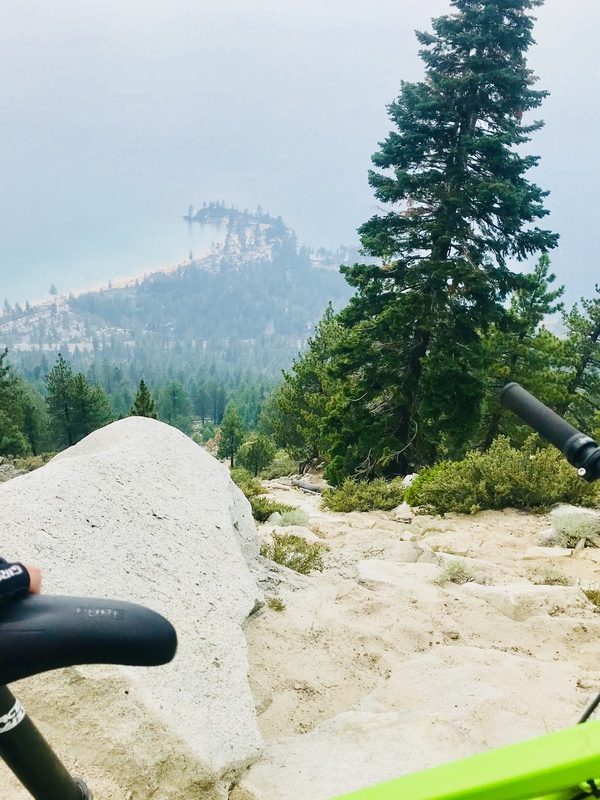 This ride includes two climbs, but the first (the Angora Ridge) is the most difficult. Both downhills are really good fun with seemingly long, flowy downhill rides. 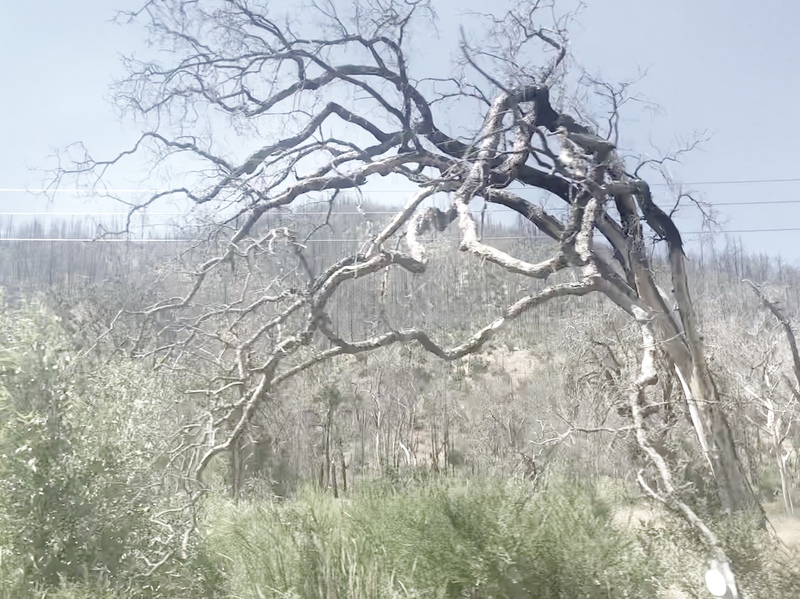 The second half of the ride took us through the Angora Forest which was decimated in 2007 by forest fires. What would have been a forest ride was now jarred with burnt trees. 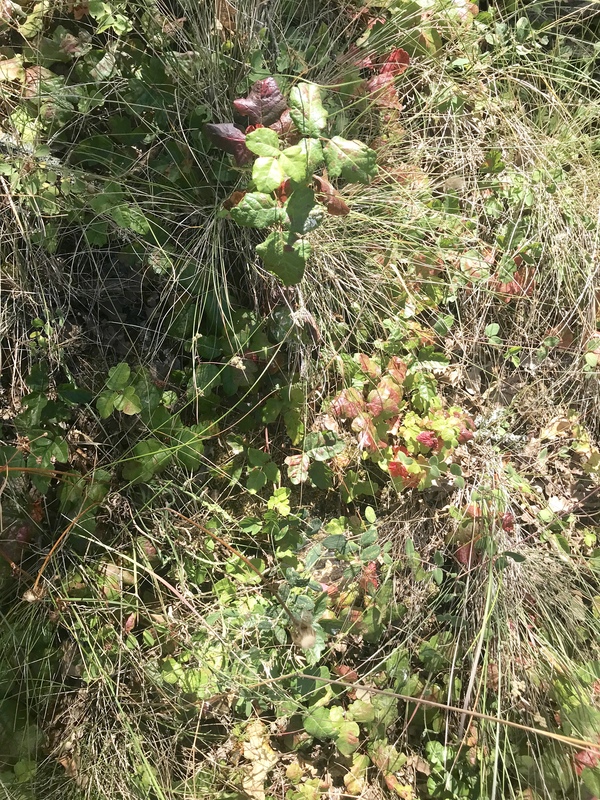 However the trail was really pretty, with new flora developing on the once tree covered hills. It is a pity there are many forest fires burning in California at the moment, I believe to date these are the worst on record. Not only do they destroy homes, the ash can spread hundreds of miles which is why these photos look so murky and don’t show the stunning views as they should. Camping Next to Lake Tahoe. We met up with our buddy Kurt at a local supermarket and completed our shopping for supplies. Having recently purchased his own truck, he took the opportunity to get it out on the open road for a good drive. 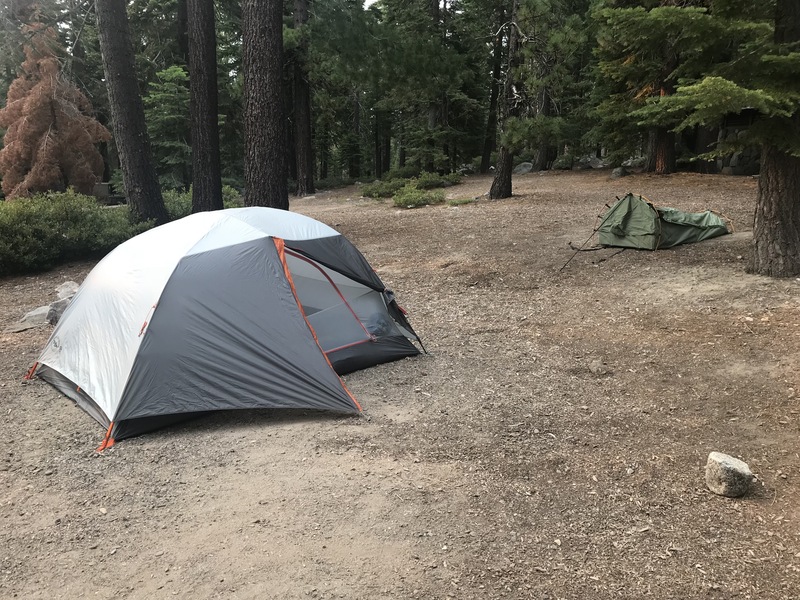 Lindsay had managed to nab the last campsite at Bliss State Park, bordering Lake Tahoe. This is bear country, and the park provides sturdy steel storage lockers for all things smelly. This includes food, sunscreen, the lot. They suggest taking these items out of the car and storing them in the lockers or face a fine up to $1000. I felt a little concern about sleeping in a light tent, whilst our food stayed safe in bear proof lockers. After all, wouldn’t I be tasty bear food? We had a great deal of laughs as we set up camp. Kurt had initiated a trial of a Trucktent. And like the good woman I am, I stood back watching with amusement as two engineers attempted to erect the cumbersome unit. I offered a couple of tips which were well received. Unfortunately, the final unzip is where plans fell apart, with a tear appearing on the ill-fitting tent. Kurt had bought along his Aussie back up. A Swag Tent, which is a complete bed and one man tent which only needs to be unrolled, and 3 small tent poles inserted! Except for the heat, Kurt slept like a baby. We settled in for the eve with chipmunks scurrying about, expectantly burrowing into the ground. 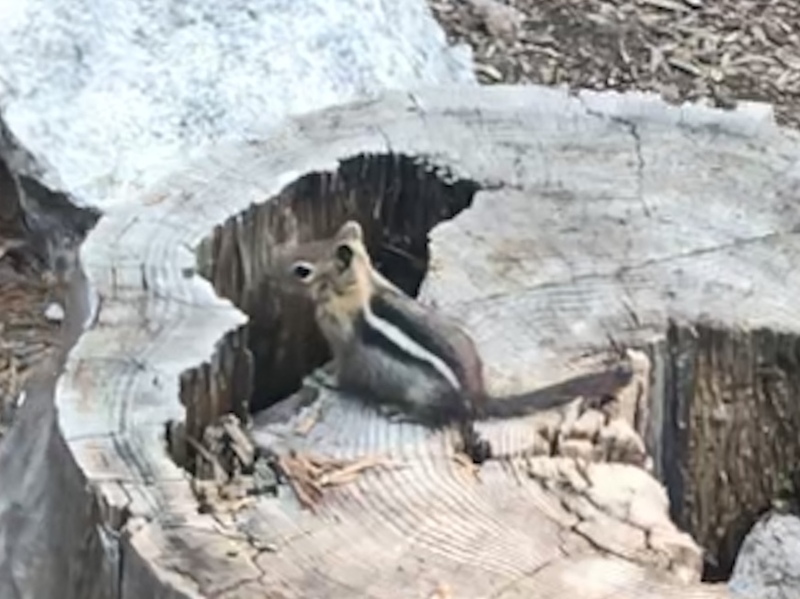 It was our first time seeing these little creatures and we were delighted. 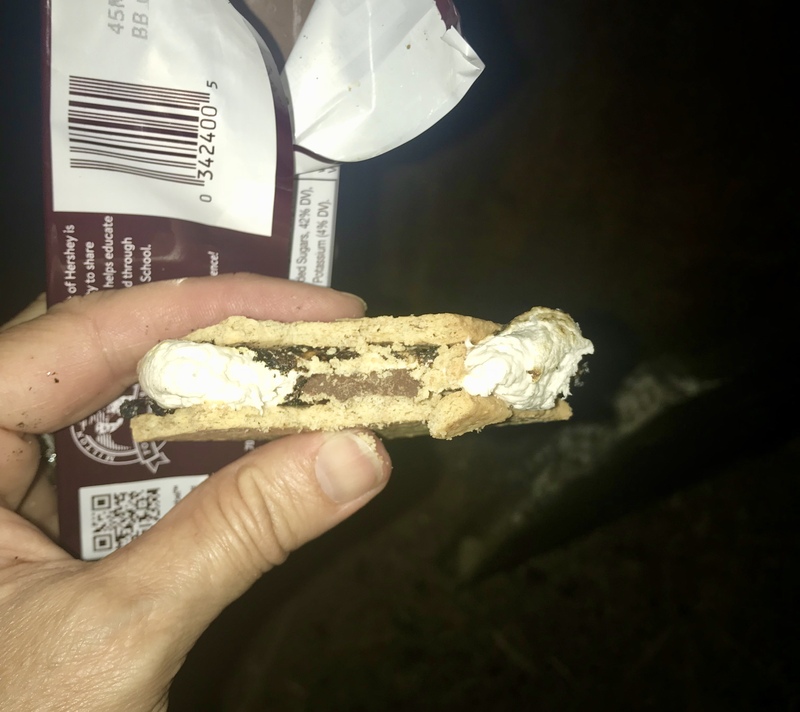 The boys proudly built a fire and as night settled in we attempted S’mores, an American delight….though one each was enough for us. In the morning we headed down to the lake for a refreshing dip. 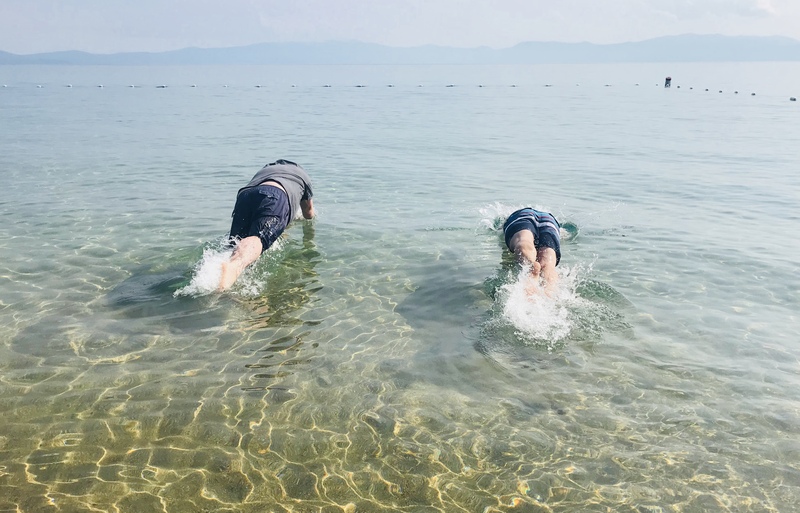 The waters of Lake Tahoe were cool, but beautifully clear. 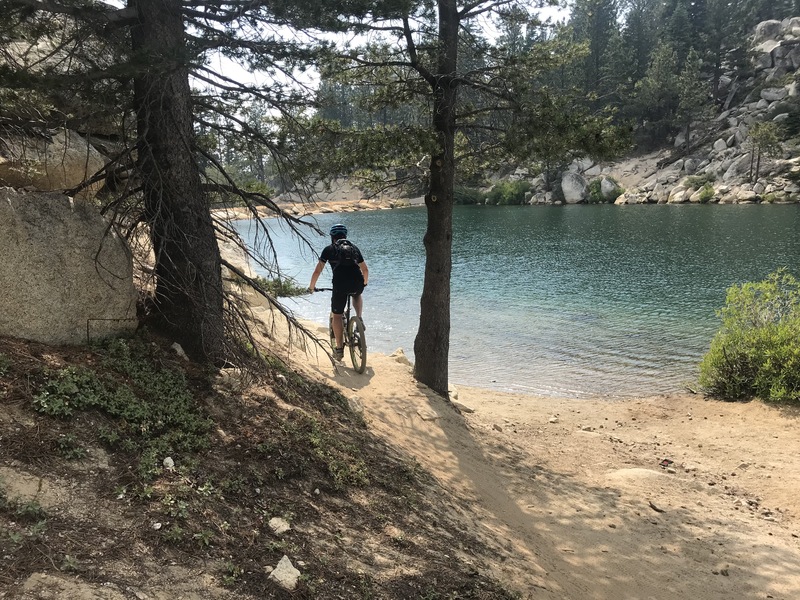 The next day we parted ways with Kurt and headed to an iconic U.S. trail, and probably my second favourite scenic ride of all time (My favourite is the Motu Trails in New Zealand). It’s known as the Flume Trail and it follows the old log flume that was used to extract timber from the forests above. We drove to the bottom of the trail where an organisation called Flume Trail Bikes have shuttles (and MTB rentals) that will drop you at the start of the trails. We just missed the 12.30 shuttle so stopped for lunch at the café next door to the shuttles, We then got a ride on the 2pm shuttle to the beginning of the trail. The climb is slow and steady, not steep but the altitude makes it tough. Even though I’m asthmatic I was okay, maybe as I’d taken a puff on my Ventolin inhaler. But Lindsay struggled with a high heart rate. 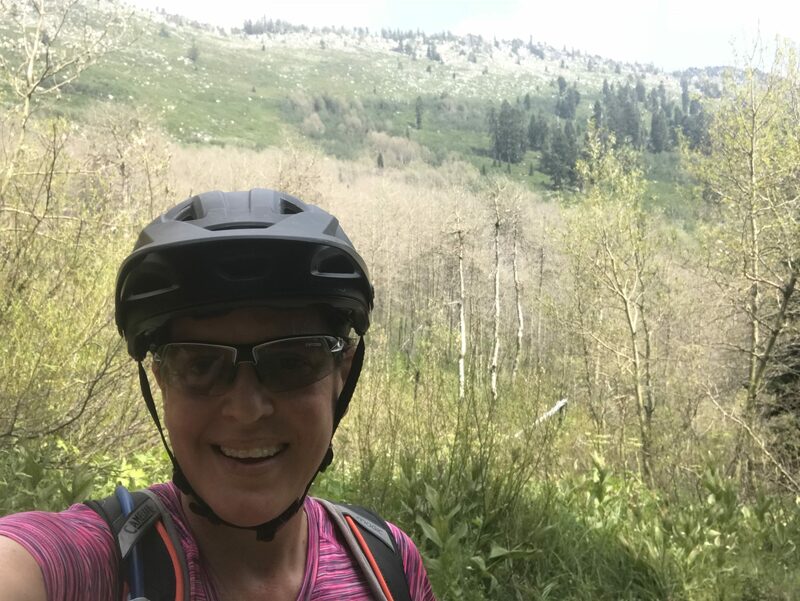 Both of us were sweating heavily and had to finish the very top of the climb on foot pushing our bikes, when the incline got a little steeper. Once the inital climb is over, that’s it…no more climbs. The ride from there is flat with the slightest downhill incline. Pure bliss! 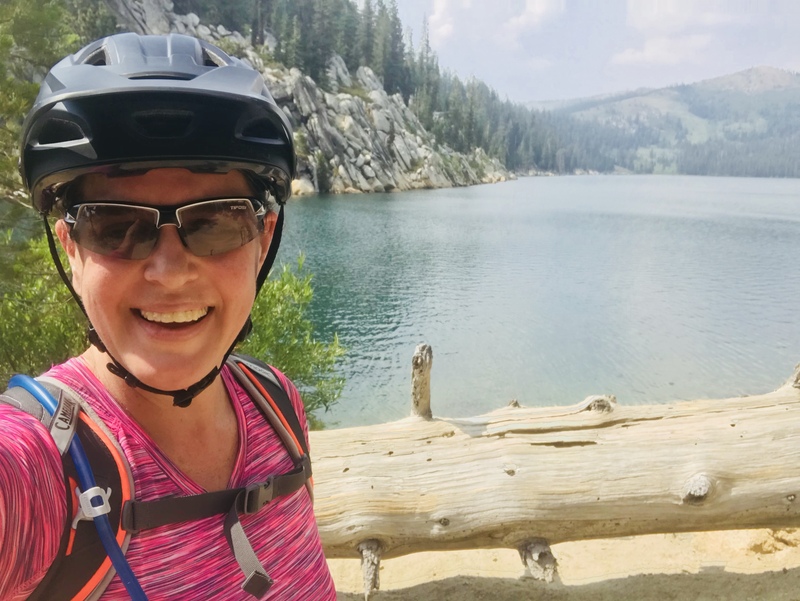 As we cycled past the stunning Lake Marlette Lindsay exclaimed that he could absolutely imagine a bear or mountain lion wandering out of the hills. As we came to the end of the Marlette lake, there is a reservoir that shines a stunning emerald/blue colour. This reservoir is the start of the old log flume that has been removed. 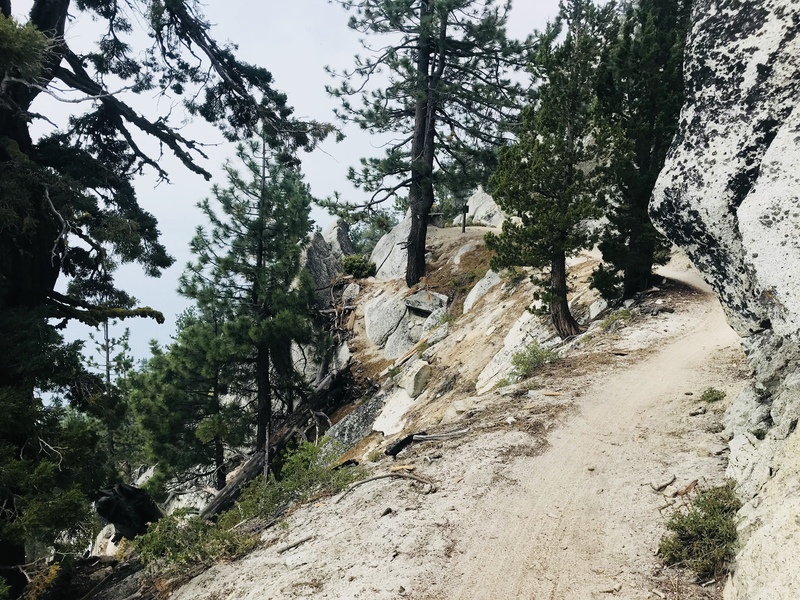 Now it’s a stunning single track that works its way through sparse forest, and along the side of sheer cliffs which tumble down to Lake Tahoe below. The ride is exhilarating, keeping the adrenaline pumping as you ride along the track, and the scenery is breathtaking. 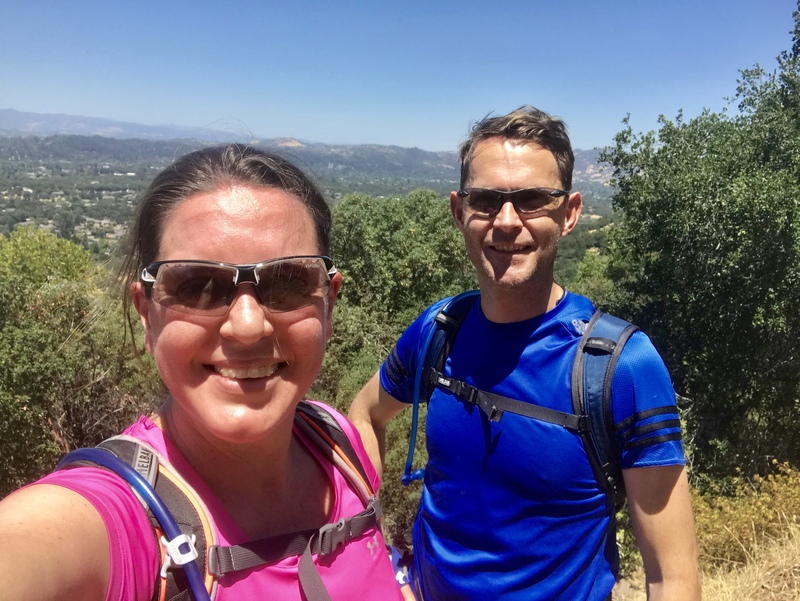 Several times we passed a fit looking man in his early 20’s, who was literally throwing himself on the trail, begging his buddy to get search and rescue to pick him up because he was too tired. He was riding with his backpack wildly swinging from the bars, and he was making a amazing ride exhausting and dangerous for all around. Don’t be fool on this ride, wear your gear correctly, and keep a good head. And as on any ride, know your level of fitness, and ride to that. Once you’re in, the only way out is by riding. The end of the ride takes you down a long, sandy, fun downhill and you can ride right off the hills and straight back to the car. The shuttle dropped us to the bottom of the trail about 2.30pm, and we were packed and back underway by 5pm. Billy Goats Required! So rough I jiggled an old wrist fracture loose. In the USA many companies close down for the week of July 4th. We decided to use the opportunity for a summer holiday/vacation with a MTBing / camping weekend. 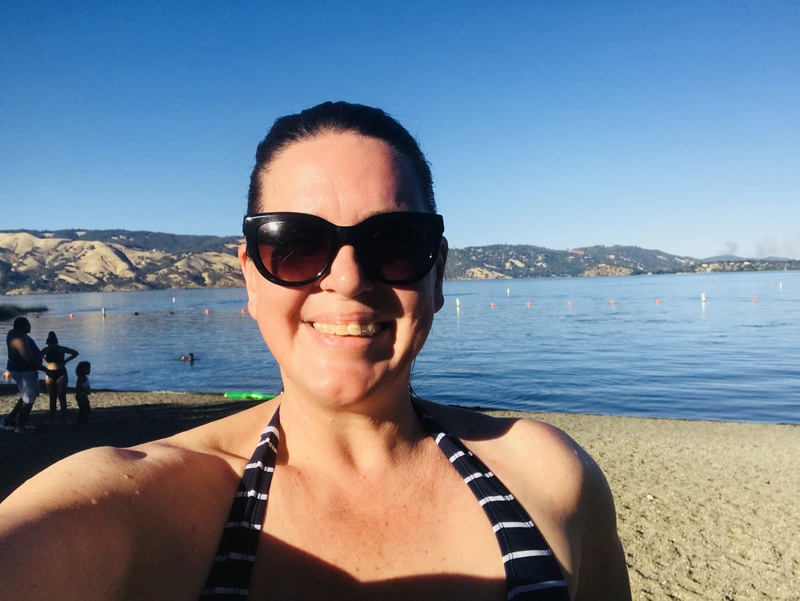 As the weather was fast warming up, we decided to go camping close to Clear Lake, a couple of hours drive north of San Francisco, where we could take a dip after our first days riding. 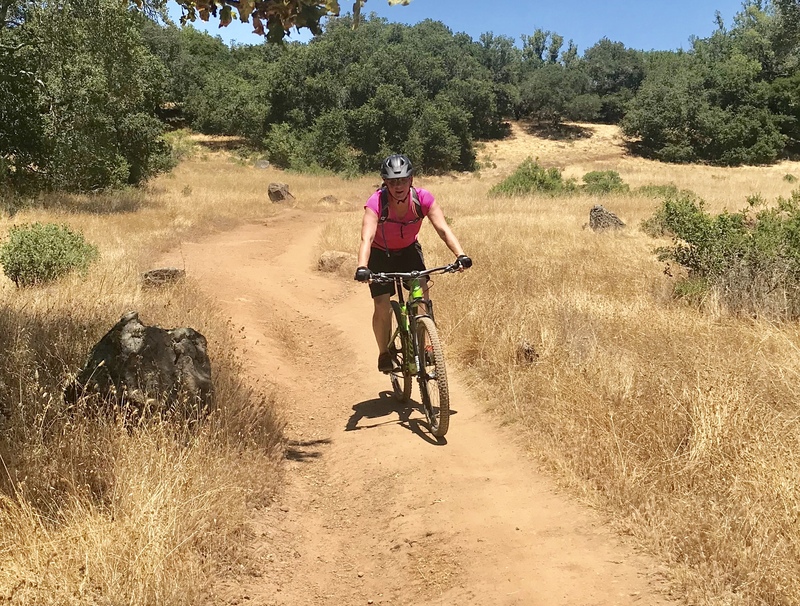 It was a fortunate decision as weather warnings were in place for temps in the early 40’s C/100’s F.
On the way to the camp site, we stopped off at Trione Annadel State Park for a 16+ Mile Ride on the Big Loop. When we arrived the temperature was already starting to heat up. The beginning of the road takes you up Cobblestone Trail, a tenuous description for what is a two-way easy incline, but a very bumpy ride. Not long after starting my heart was beating fast. I was starting to sweat a lot and I had a bit of a funny tummy. Meanwhile, Lindsay was feeling awesome. About 10 miles into the ride we stopped at a large dammed lake. Another couple had stripped down to their underwear and had waded in for a dip. I contemplated following them in, but once I’d had a snack and a shaded sit down, I felt a little better. Before we headed off, a local artist wandered into the area and informed me that the innocuous greenery I had rested my bike in was in fact poison ivy, and that I should give my bike a wipe down before carrying on. I’m lucky that either I’m not affected by its oil, or I managed to avoid getting it on my body. Something like 85% of people are allergic to the undetectable sticky oil put off by all parts of the plant which can have horrific consequences!! We didn’t complete the full loop as I was going a lot slower than my normal pace, and suspect I was experiencing slight heat exhaustion. However there were some great downhills, though not for the fainthearted. They were rocky with dappled light coming through the forest canopy making it difficult to read the trail. It was mentally tiring, but well worth the effort. 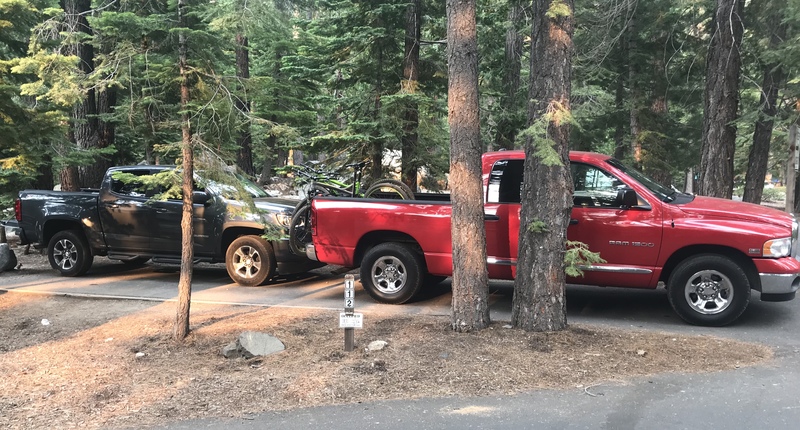 We made it to the end of the trail later than expected, happy to climb back into the strategically parked truck, now shaded by the surrounded brush. At the end of the ride I remembered several lessons we had learnt from riding in the heat of Phoenix, AZ. 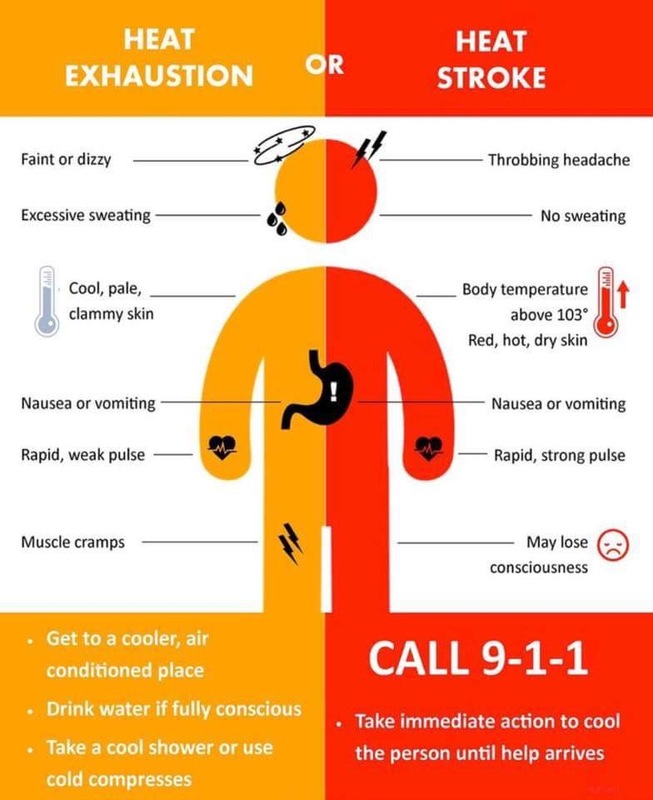 First, take lots of breaks and pre-hydrate. Second, pre-load with a little food if we head out in the late morning. 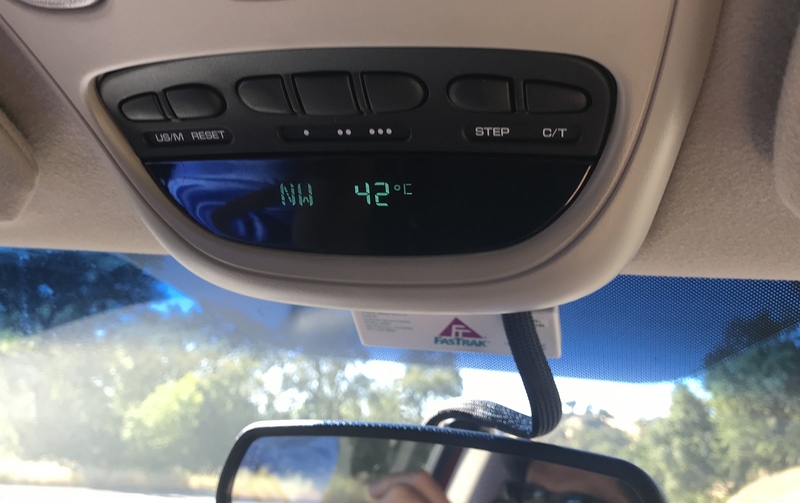 Finally, turn up the temp in the car so as not to get out of a pleasantly cool car, into intense warm heat. We arrived at the Clear Lake State Park campground at about 5.30pm after having gone shopping for food and supplies. It had some fairly decent amenities with pretty water filled inlets stretching well into the grounds. We erected out tent and headed down to the lake on our MTB’s as the site is fairly large. 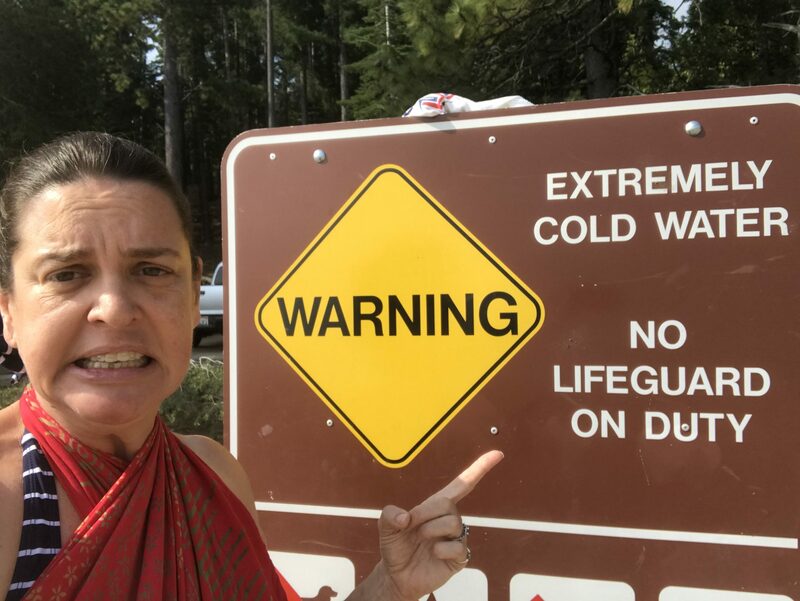 The lake was surprisingly warm which I suspect contributed to the algae bloom occurring in the water. As we waded in we could feel large flurries of soft algae swish past our bodies. Apparently Clear Lake is fantastic for fishing off shore and now I believe it. I’m a water baby, I grew up swimming, water skiing, snorkeling. Lindsay and I met Scuba Diving! But I was surprised when I felt a nibble on my heel, letting out a small squeal. Lindsay laughed until he later felt a nibble on his toe, after which he quickly exited the water! 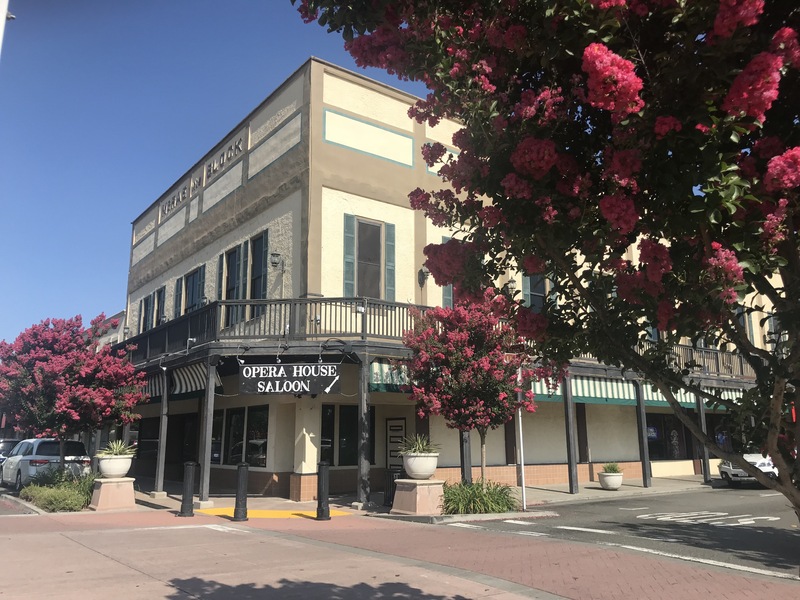 The next day, feeling refreshed we headed back to San Francisco via Napa County. Lindsay had originally picked a cycle trail close to the campsite, though he noticed there hadn’t been a lot of recent updates on the MTB Project link. 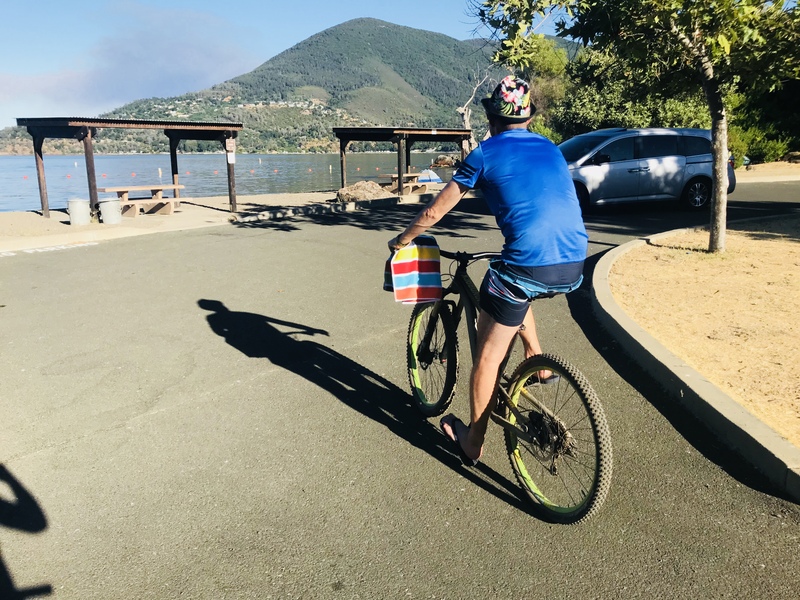 It turned out as we headed in the direction of the trail that the forest had been burnt out in 2017 California Wine Country Fires with the entrance to the trail gated and shut. 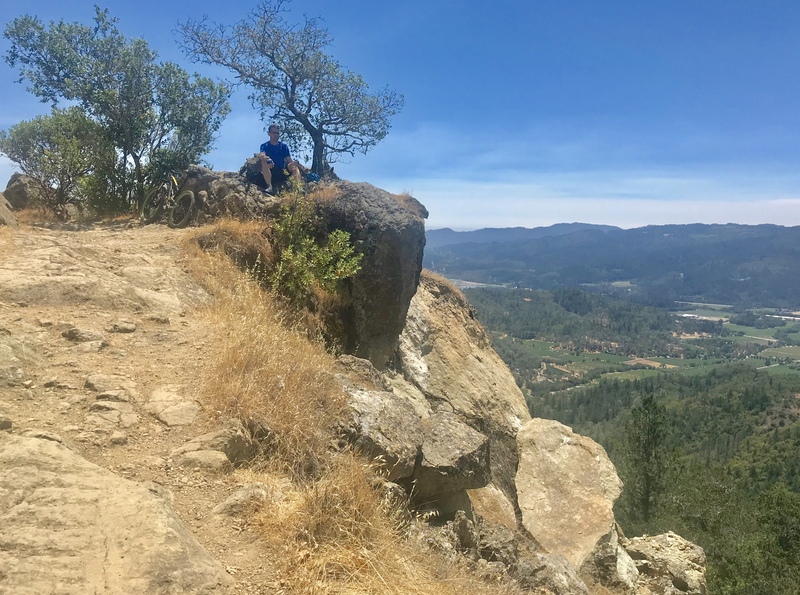 Lindsay did a quick search and he found the Oat Hill Mine Trail, boasting views out over the valleys and vineyards of the upper Napa region. It was getting late in the morning so following the lessons learnt from yesterdays’ ride, we loaded up on peanuts and water. We then found a park for the truck, under the shade of a tree, and headed out. The ride is an out and back ride – straight up, and then straight down the same path. The incline was steep though rideable, but seemed to throw up every type of rock garden imaginable. At times we had to pick our trajectory carefully through jutting rocks, shale, or over long bumpy rock faces. 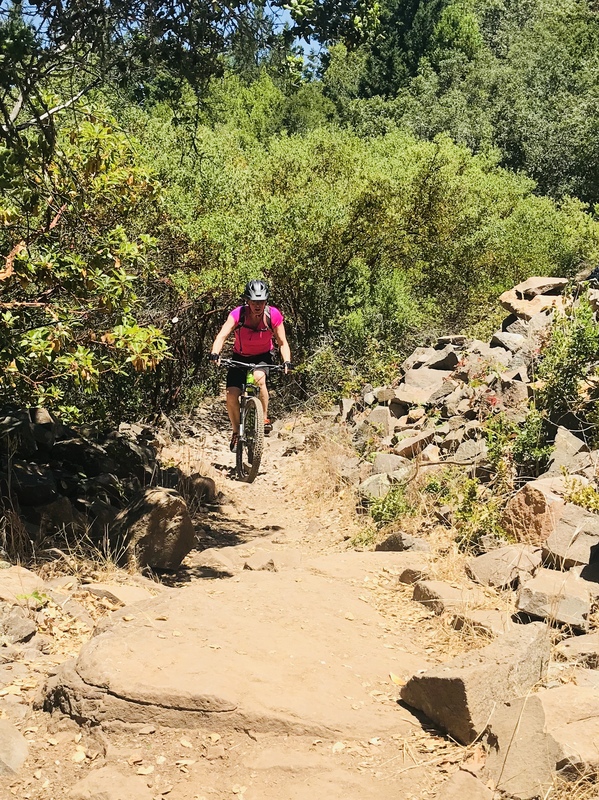 It takes a fairly experienced rider to stay on the bike over all the terrain, otherwise there would be a fair amount of pushing. 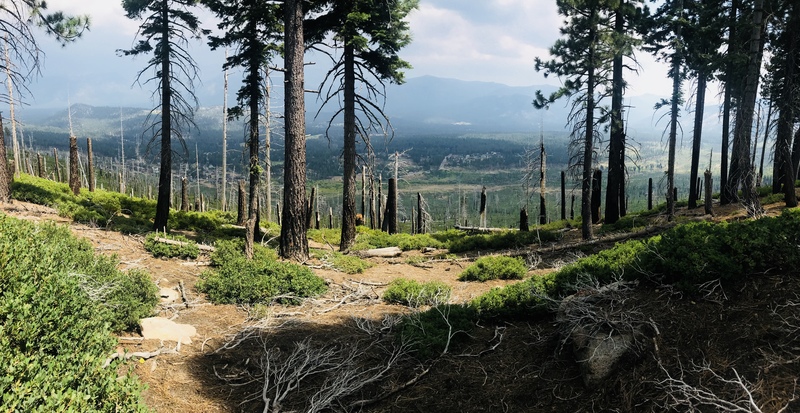 We took a lot of breaks to cool down, stopping at the 3 mile point to refuel, whilst sitting on a jutting rock taking in the spectacular views. 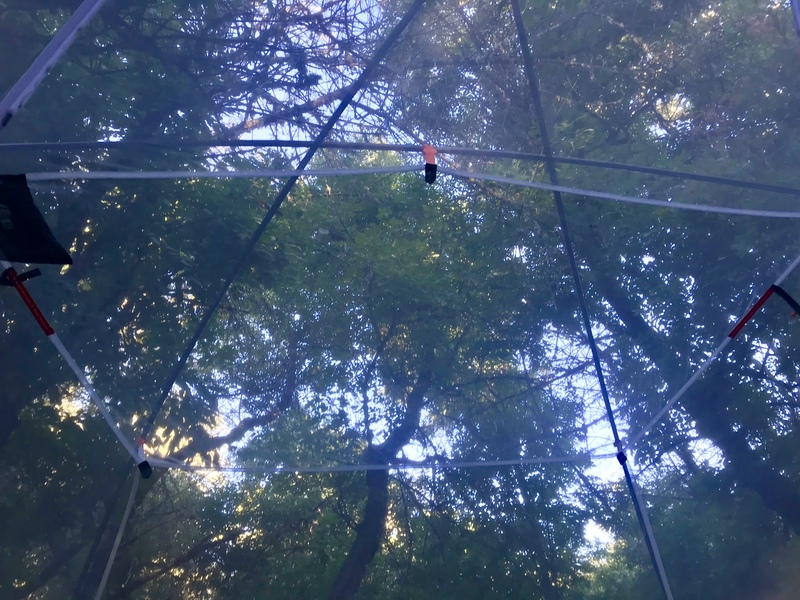 There was good canopy shelter over the lower parts of the trail, which then thinned out as we climbed. At about 4 miles into the 4.3 mile ride we were both pushing our bikes up hill over jutting rocks that were un-rideable and unpleasant. We decided to abort the attempt to get to the top, turn and ride the 4 miles back. A fun down hill proceeded, but after riding over all those jarring rocks, my left wrist started to ache. A week later I had the wrist x-rayed. 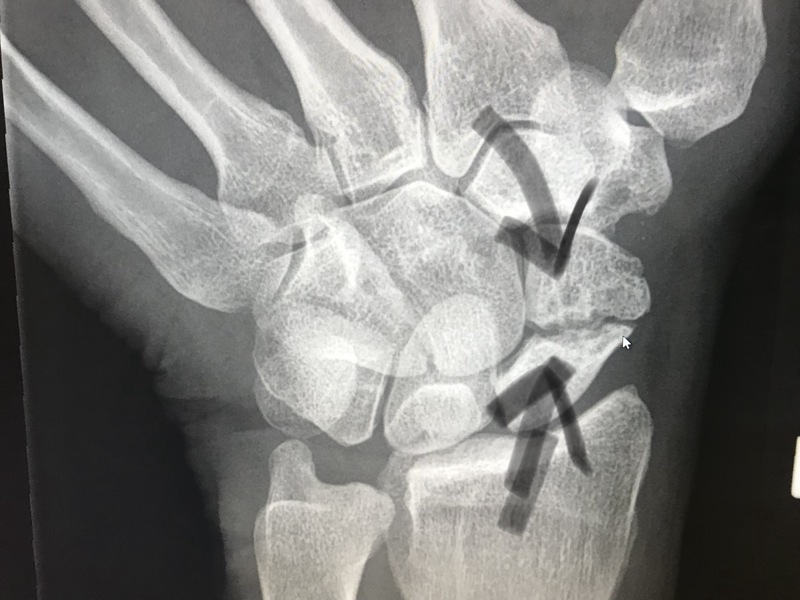 It turned out that I’d jiggled an old fracture of the scaphoid bone in my wrist, lose. It took three surgeries and 2 yrs to heal last time. Fingers crossed, it’s a little faster this time. However…it won’t and hasn’t yet stop me riding.